It's been a while, but with the summer rapidly coming to a close and the fall fast approaching, I thought it was best to clear out some of my leftover APs I had lying around my desk from various sketch card sets. Prices vary, so please either shoot me an email (slswanger@gmail.com) or send me a note for details. In addition to the APs, I currently have 8 blank Star Wars sketch covers available for commission. I am asking $100 for front only or $200 for front and back - gray tones or full color. 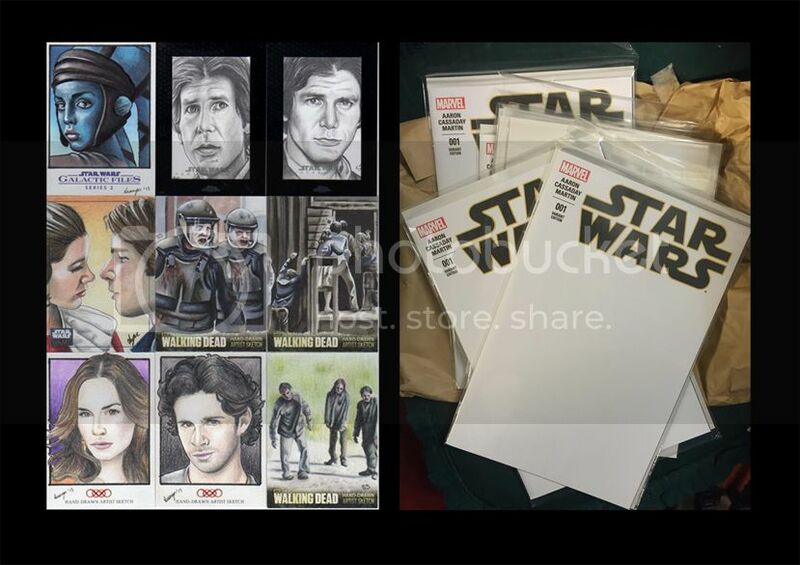 Hi, i just bought your star wars sketch card of Harrison Ford on ebay, that is an amazing piece!!! In just a few days, may you have a most happy birthday, for that is the day that you descended upon the Earth in a shower of lightening! Also, have delicious that day! Fantastic work! Love the Star Wars cards. Hi. Just curious. How long did it take you to paint that Mars Attacks sketch card Washington in Flames?